Wondering how long would it take to walk a mile? Well, naturally the time it takes depends on many factors, such as: your fitness level, body weight, health condition, age, gender, the weather conditions, the surface and inclination you are walking on, your pace and many others. On average, it takes 19.1 minutes to walk at a leisurely pace, 14.2 minutes at a purposeful pace and about 10.2 minutes at a brisk pace. So, walking a mile leisurely will actually take you almost twice as longer than walking the same distance at a brisk pace. In miles per hour, walking purposefully is with a speed of 4.2 miles per hour. To calculate how long it will take you to get from point A to point B, you can use the Google map pedometer tool to calculate your trip. The average human leisurely walking speed is 3.14 miles per hour, the average purposeful walking speed is 4.22 miles per hour, and the average brisk speed is 5.88 miles per hour. Brisk walking means walking as fast as possible before starting to actually run. Brisk walking for longer distances takes a lot of exercise and practice. At the same time, normal or leisurely walking can be sustained for much longer distances and for a longer period of time, and requires much less effort or training. Of course, if you are walking a mile uphill, it will take up more energy and likely take more time than walking on flat surfaces. Also, if you are walking in snow, strong wind or other bad weather, this will also probably slow your pace down and thus walking a mile in such conditions will take longer. There are some walking time calculators which you can find and use online for free. They work by entering the number of miles, blocks or kilometers you are planning to walk, the type of pace you plan to sustain (normal, leisurely or brisk) and the entire distance you want to walk. The calculator will quickly calculate the approximate time you should expect to spend walking if you maintain a steady walking pace, and do not make any stops or take breaks on the way. 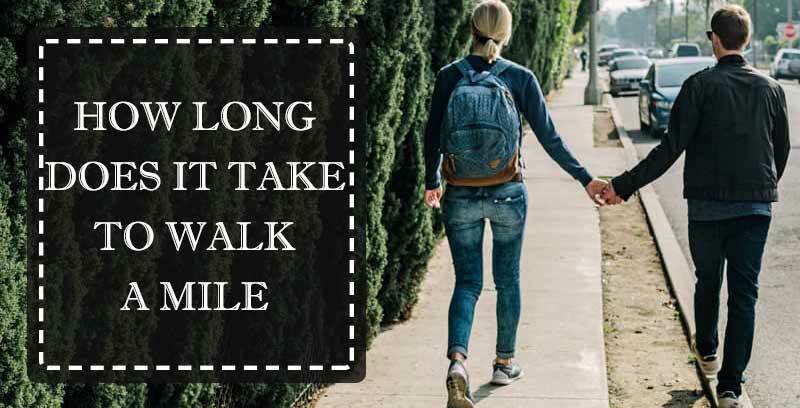 If you want to start walking as a daily exercise (which is an excellent idea according to the the American Heart Association), you can plan a 30 minute daily walk, or if you want to walk more so that you lose weight and improve your overall fitness level, you can plan longer 1 hour walks. Remember that depending on the pace you can walk different differences for the same period of time. For example, a 3 mile walk at a leisurely pace will take nearly an hour (58.1 minutes) while walking 3 miles at a brisk pace will take half an hour (30.5 minutes), a 3 mile walk at a normal pace will take about 42.9 minutes. If you are planning to walk a mile a day in order to lose weight, you must be warned that losing weight may not happen for at least a month or more. Of course, the amount of weight lost and the speed of the weight loss process depends on your body type, weight, condition and of course your calorie intake as well as a number of other different factors. Your current weight is crucial for the calories which are going to be burnt while walking. For example, a 125 pound person who walks leisurely for 30 minutes will burn 120 calories, and at the same time a 155 pound person will burn 149 calories for the same leisurely 30 minute walk, and a person weighing 185 pounds will burn about 175 calories for the same activity. So, the heavier you are, the more calories will be burned when walking. Of course, the speed you walk is also a serious factor for how many calories will be burned. So, depending on such factors, you should expect to drop your first pound in about 40 plus days after you have started walking a mile per day. For a 155 pound person, losing 1 pound means needing to burn 3,500 calories more than have been consumed. To boost the weight loss from walking, increase your walking time. Add just 15 to 17 minutes, and this could improve or double your calorie burn. As you get fitter, you will find that you will be able to increase not only your walking time, but your pace as well. By increasing your walking pace, you are burning more calories. It is mandatory to get comfortable walking shoes, if you want to walk more. You can further help the weight loss process by adding some strength exercises to your daily regimen, such as: sit-ups, pushups, squats, lunges and others. By training your muscles you cause more calories to be burnt, because muscles are more efficient in calorie burning than fat. Also consider adding strength training into your routine two or three days a week, doing sit-ups, pullups, push-ups, lunges and squats to start. Muscle burns calories more efficiently than fat, so getting stronger will also help you lose weight faster.